The Welland Fosse Benefice is the formal name for our group of churches: St Peter’s Church Barrowden, St Mary’s Church Duddington, St Mary’s Church Morcott, St Mary’s Church South Luffenham and St Luke’s Church Tixover. The Priest-in-Charge of the Welland Fosse Benefice is The Very Reverend Chris Armstrong, who fulfills this role on a part-time basis. He and his wife Gerry are based at Barrowden Rectory. Most day-to-day enquiries may be dealt with by the Churchwardens in each parish, who are ‘on the ground’. To contact Chris (his usual duty days are Friday, Saturday, Sunday and Monday) call 01572 748 634 or email priest-in-charge (at) wellandfosse.org . Christopher is supported in his work by our volunteer Reader, Mrs Ann Robinson, who is based in South Luffenham. Each village in our group of parishes is different in character and size, from lively Barrowden (which has a doctors’ surgery, pub, shop and village hall as well as the church) to tiny Tixover, our ‘church in the fields’. The Welland Fosse group of churches straddles the River Welland: Duddington and Wakerley are officially in Northamptonshire; Barrowden, Morcott, South Luffenham and Tixover are in Rutland. 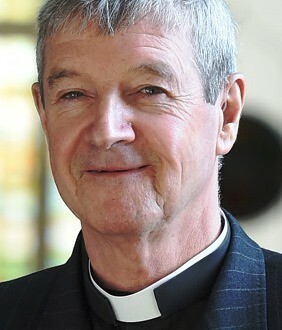 We are part of the Diocese of Peterborough, which is led by Bishop Donald Allister. Our group also includes the little parish of Wakerley which is linked with Barrowden. Wakerley Church (St John the Baptist) is officially ‘closed’ for normal services and is cared for by the Churches Conservation Trust.